The old palace buildings within the fort along the riverside at Monghyr (Bihar). bl.uk > Online Gallery Home	> Online exhibitions	> Asia, Pacific and Africa Collections	> The old palace buildings within the fort along the riverside at Monghyr (Bihar). Watercolour of palace buildings in Bihar originally from 'Views by Seeta Ram from Moorsheedabad to Patna Vol. I' produced for Lord Moira, afterwards the Marquess of Hastings, by Sita Ram between 1814-15. Marquess of Hastings, the Governor-General of Bengal and the Commander-in-Chief (r. 1813-23), was accompanied by artist Sita Ram (flourished c.1810-22) to illustrate his journey from Calcutta to Delhi between 1814-15. Idealised view of the old palace buildings within the fort along the riverside at Monghyr (Bihar). 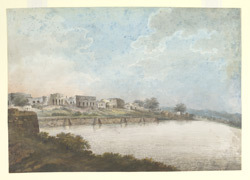 The fort at Monghyr was occupied by Nawab Mir Kasim of Bengal and a principal defence point during the battle at Udhua Nullah when he was defeated by Major Adams in 1763. Inscribed below (cut out from original backing paper): 'Riverside at Monghir'.